The Knicks used the No. 9 pick in Thursday night’s NBA Draft on Knox, a versatile 6-foot-9 forward from Kentucky, who averaged 15.6 points. A lot has been made about his sweet stroke and ability to stretch defenses. But that’s not what might separate Knox from the group of very talented forwards that was in this draft. Knox, 18, is hard to the core, a trait that jumped out at the Knicks when they had the second youngest player in the draft in for a workout. It was, according to one person familiar with the workout, a street fight. “He really responded well to the physicality,’’ said Knicks coach David Fizdale. “That was, I would say, our best workout out of all the workouts we had. You’re talking about physical, guys hitting the floor. So does this. 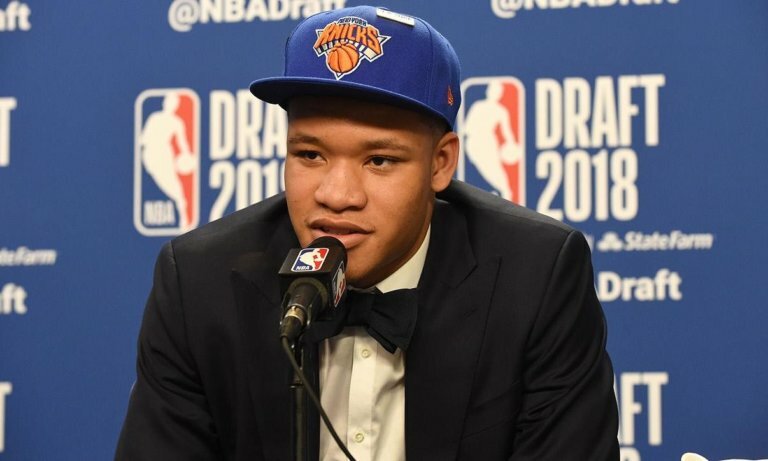 Although Knox was able to joke about it on Friday when he was officially introduced at the team’s training facility, the fact that Knicks fans booed him on draft night won’t soon be forgotten. Knox said he got a Facetime phone call Thursday night from Knicks star forward Kristaps Porzingis. KP was booed when the Knicks took him with the 4th pick in 2015. It’s a funny anecdote for sure. Knox’s dad said his son is not laughing on the inside. Which begs the question, what will Knox’s role be on the Knicks in his rookie season? Fizdale not only said he has no hesitation starting the rookie if he earns the spot, he offered up a lofty comparison. Fizdale noted Knox’s desire to play at Kentucky, which has the most fervent fan base in the nation, and his desire to play in New York, which has the nation’s largest media market, also says a lot about the rookie’s fortitude. It was shaped at home. Kevin Sr. played one season in the NFL with Arizona Cardinals. He’s spent the last 10 years working for the Tampa Housing Authority, working to keep children on the right path. He wants to work with the New York City Housing Authority if given the chance. Kevin Jr. volunteered for his father in the summer, mentoring kids. His mother, Michelle, has been a social worker in Tampa for 17 years. Blue color; red hearts. Hard Knox. Sweet Shot. Just what the Knicks wanted in this draft.